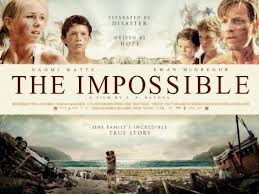 THE IMPOSSIBLE manages to do what I would have indeed thought impossible: Make a tsunami boring. Actually, that's not accurate. The tsunami, which occupies the first twenty minutes or so of the movie, is breath-taking. The film makers used models, CGI, and live action, and when the wall of water sweeps over the edge of an Indonesian resort and carries everything along with it, I felt I was there. This sequence should win an Oscar for Best Weather in a Supporting Role. The problem starts after the tsunami has retreated back to sea, leaving devastation in its wake. Five members of a vacationing British family, one of them badly injured, try to get to safety and find each other. Eventually they all do, along the way helping a few other victims, as others help them. We see a lot of pain and suffering and destruction. But it's all one note: This is terrible. Of course, it IS terrible. But disasters happen to real people, and these characters are not that. We never learn anything more about any of them other than the fact that they got caught in a tsunami and didn't like it. In addition, nearly all we see of this human tragedy are happy outcomes. The British family all survive and are reunited. A child is returned to his family. A father and son are reunited. At the end, there is one instance of a man who lost his family to the water, but he is not a developed character, either. Other disaster movies have at least tried to give us a variety of characters, with a variety of human reactions, including selfishness. This one doesn't. The only selfish note anywhere is a man who refuses to lend his cell phone because he's low on minutes. "American audiences like happy endings," one person involved with the movie said in an interview. Well, I'm an American, and I would have liked more shading to the script, more dimensions to the characters, more point of view about what nature can do to us. But the re-creation of the tsunami is incredible. I know I have posted no new reviews of anything for a while...despite having read and viewed books and movies. First Christmas, then a back injury, and now I am moving. But Real Soon Now! I will vanquish the moving cartons! I will!